Clay Hall of Stoneville, N.C. has been hunting deer in Rockingham County since the 1980s, and he’s killed plenty of quality deer. But he killed his biggest, a 13-point, 150-class buck, this past Saturday, Oct. 27, when a buck he’s watched on trail cameras for years finally showed up during shooting hours and offered him a good shot with his Thompson Center Omega .50 caliber blackpowder rifle. 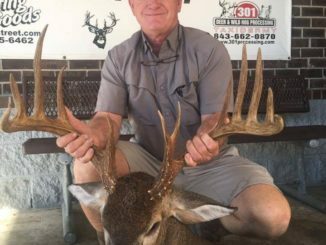 Father and son duo, Jerry and Carson Lee of Johnsonville, S.C., blasted two 150-inch bucks less than 12 hours apart in the wake of Hurricanes Florence and Michael. 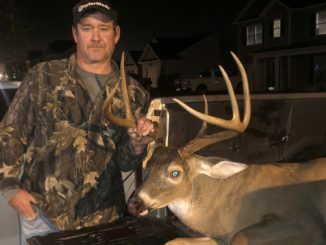 The Lees had been watching both 14-pointers for more than a year on their two hunting properties — one in Williamsburg County and the other in Florence County. After three years as acquaintances, Alec Robertson of Reidsville, N.C., finally got to meet an old friend. 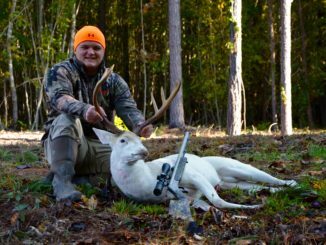 Robertson, an 18-year-old student at Rockingham Community College, had three years worth of trail-camera photos of a glorious white buck on some family property in his home county. He saw him for the first time this past Saturday around 6:15 and killed the big buck moments later on opening day of blackpowder season in Rockingham County. If you ever get an invitation to fish Par Pond, don’t miss it. 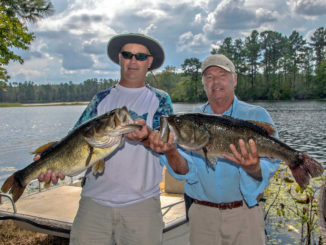 Par Pond, an approximately 2700-acre body of water located at South Carolina’s Savannah River Site, is managed by the Dept. of Energy. 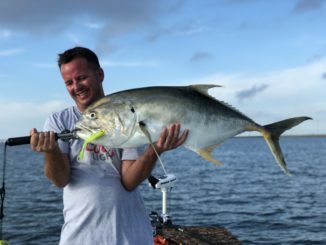 While not open to the public, it is open to fishing a few times each year for special occasions, including a recent fishing tournament for a small number of first responders and those who work in law enforcement. Jason Lindler of Lexington, South Carolina has beaten the bushes looking for a trophy buck for over 30 years. 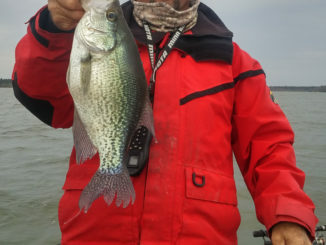 And on Oct. 26, a day of relentless rain and wind, Lindler finally found one. 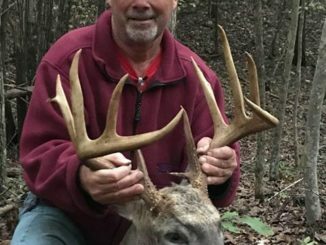 He killed the biggest deer of his life — an eight-point, 140-class trophy that evening. 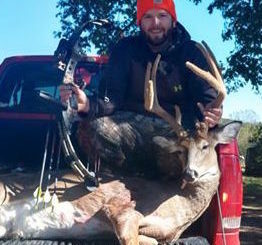 When Codey Cromer of Lawsonville, NC saw a tall-racked, full velvet buck on his Stokes County hunting lease on the morning of Oct. 21, he knew it was a special deer. So he wasted no time drawing back on his Buckmaster BTR bow and firing straight through the buck’s vitals from 20 yards away. 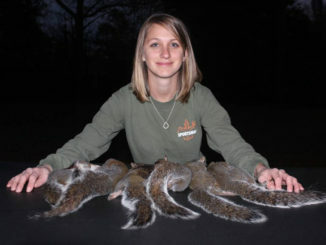 It’s squirrel hunting season in both Carolinas, and pursuing these critters can be a nice change of pace from either fishing or sitting in a deer stand waiting for something to happen. With plenty of squirrels around, hunters can increase their chances of success with a these five tips. 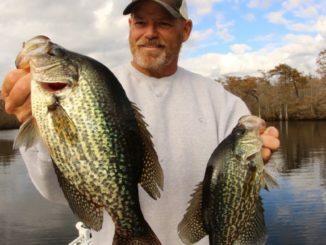 The November crappie bite is usually hot, and you’ll find no shortage of diehard anglers spider-rigging their way across lakes and reservoirs, but you’ll have little competition from anyone on South Carolina’s Wateree River. 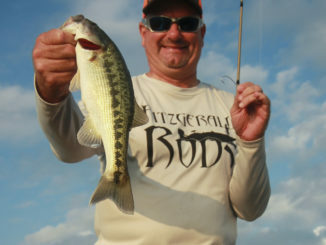 Bass pro and guide Todd Goade of Suwanee, Ga., said November is one of the best times to catch spotted bass on South Carolina’s Lake Keowee — for numbers and size.